A naturalist who spent months at a time living on her own among wild creatures in remote jungles, Sy Montgomery had always felt more comfortable with animals than with people. So she gladly opened her heart to a sick piglet who had been crowded away from nourishing meals by his stronger siblings. Yet Sy had no inkling that this piglet, later named Christopher Hogwood, would not only survive but flourish–and she soon found herself engaged with her small-town community in ways she had never dreamed possible. Unexpectedly, Christopher provided this peripatetic traveler with something she had sought all her life: an anchor (eventually weighing 750 pounds) to family and home. 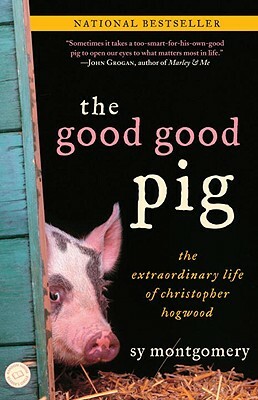 The Good Good Pig celebrates Christopher Hogwood in all his glory, from his inauspicious infancy to hog heaven in rural New Hampshire, where his boundless zest for life and his large, loving heart made him absolute monarch over a (mostly) peaceable kingdom. At first, his domain included only Sy’s cosseted hens and her beautiful border collie, Tess. Then the neighbors began fetching Christopher home from his unauthorized jaunts, the little girls next door started giving him warm, soapy baths, and the villagers brought him delicious leftovers. His intelligence and fame increased along with his girth. He was featured in USA Today and on several National Public Radio environmental programs. On election day, some voters even wrote in Christopher’s name on their ballots. But as this enchanting book describes, Christopher Hogwood’s influence extended far beyond celebrity; for he was, as a friend said, a great big Buddha master. Sy reveals what she and others learned from this generous soul who just so happened to be a pig–lessons about self-acceptance, the meaning of family, the value of community, and the pleasures of the sweet green Earth. The Good Good Pig provides proof that with love, almost anything is possible. Sy Montgomery is a naturalist, author, documentary scriptwriter, and radio commentator who writes for children as well as adults. Among her award-winning books are Journey of the Pink Dolphins, Spell of the Tiger, and Search for the Golden Moon Bear. She has made four trips to Peru and Brazil to study the pink dolphins of the Amazon; and on other expeditions, she was chased by an angry silverback gorilla in Zaire; bitten by a vampire bat in Costa Rica; undressed by an orangutan in Borneo; and hunted by a tiger in India. She also worked in a pit crawling with eighteen thousand snakes in Manitoba; handled a wild tarantula in French Guiana; and swam with piranhas, electric eels, and dolphins in the Amazon. She lives in New Hampshire. Did reading The Good Good Pig make you feel differently about your relationship to animals and the natural world? If you eat meat, for example, did it make you question that? Or question other aspects of your lifestyle? Sy Montgomery writes about the extended interspecies family that coalesces around The Good Good Pig, Christopher Hogwood. If you have a pet or pets, do you think of the animal as a central part of your family unit, or as a kind of appendage to it? In what ways does your pet affect the family dynamic? Lavishing as much money and attention on any animal as the author did on Christopher Hogwood is wasteful when there are human beings in need of assistance. Do you agree or disagree with this statement? Why? Do you think you would have enjoyed having Christopher Hogwood and Sy Montgomery for neighbors? Why or why not? We humans seem to have a love-hate view of pigs. On the one hand, there are beloved and humorous fictional characters like Miss Piggy, Piglet, Porky, Babe, and Wilbur. Yet at the same time, in many religions pigs are considered to be unclean animals, and in common parlance, calling someone a "pig" is far from a term of endearment. What do you think accounts for this divergence of views? Do you feel a special connection to any particular kind of animal? If you could be an animal for one day, which would you choose and why? At the beginning of the previous century, most Americans still lived and worked on farms and had close relationships with a variety of animals, both wild and domesticated. Now only a minority of people in this country experiences a close relationship with animals other than dogs, cats, and other familiar pets. What affect do you think that has had on our sense of connection to the natural world, both individually and as a society? Is it important to have that kind of a connection? Why? Consider this quote from St. Francis: "Not to hurt our humble brethren is our first duty to them, but to stop there is not enough. We have a higher mission: to be of service to them whenever they require it." What might this service consist of? If St. Francis were alive today, how do you think he would react to the animal testing of drugs and other products, livestock farming practices, and the like? What are your thoughts about the animal rights and animal welfare movements? Are they following the advice of St. Francis or taking matters too far? What can people do to make a difference in the way animals—pets, livestock, and wild—are treated in our society? Do animals possess inherent rights that human beings are morally obligated to respect? If so, what is the source of these rights? Should animals have legal or civil rights beyond what is currently accorded them? Is the hunting and killing of wild animals an important part of human heritage that should be preserved? The people of Sundarbans regard the local tiger population as manifestations of the divine, and thus do not hunt the animals even when they prey upon human beings. Montgomery finds much to admire in this attitude. Do you agree with her? Why or why not? There are many anecdotes reflecting the extraordinary, even uncanny, sensitivity of animals toward the natural world and toward people. What examples can you give from your own experience, and how do you explain them?